Pattern includes fully charted design, yarn selection information, sizing information, tubular cast-on instructions, peasant thumb tutorial, and lovely, full color photos. 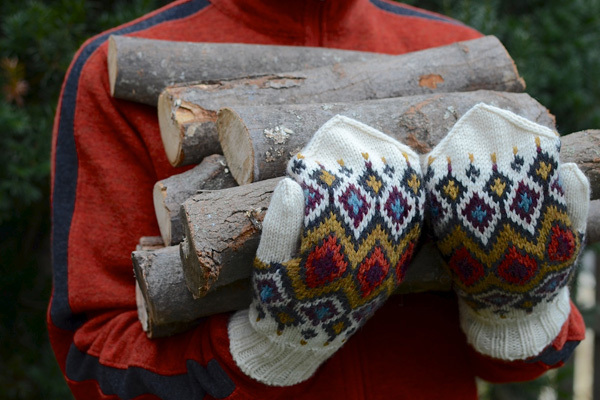 Knit in worsted weight yarn with up to four colors per round, these boldly patterned stranded mittens will keep your hands nice and toasty and provide all the color you need this winter. ACTUAL MEASUREMENT: 8.5” (9.25”, 10”) [21.5 cm (23.5 cm, 25.5 cm)] circumference, and 10.5” (11.25”, 12”) [27 cm (29 cm, 31 cm)] long. To Fit: Measure around your palm, not including and just above the thumb, with your hand splayed as much as possible. Choose the size that is just larger in circumference than your hand. NEEDLES: 3 (4, 5) US [3.25 (3.5, 3.75) mm], or size needed to get gauge. Pattern may be knit on double points, a long circular for magic loop, or on 2 circulars. NOTIONS: crochet hook for cast-on (if desired), stitch marker, smooth waste yarn for cast-on and thumbs, cable needle, darning needle. YARN: Cascade 220, 220 yards [201 meters] / 100g, MC1 – 1 skein, MC2 – 50 yards, less than 40 yards each CC1, CC2, CC3, CC4. SKILLS REQUIRED: Please be familiar with knitting in the round, stranded knitting, decreasing and increasing, and reading a colorwork chart. 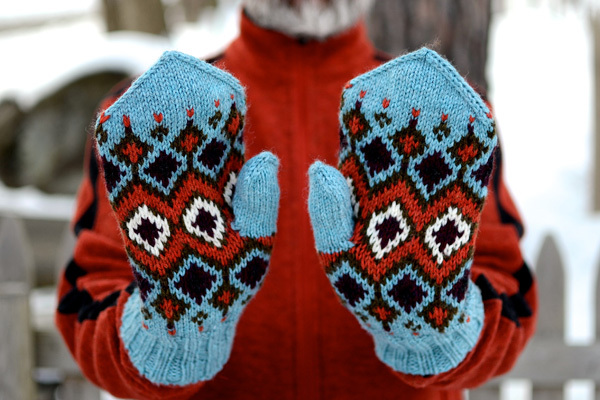 The pattern is suitable for an adventurous colorwork knitter.